Find out how to make your own Garden Cinema, how to make an outdoor screen, where you can get a projector and how you can play movies from a laptop.Work out the best place to site your outdoor screen and watch films outside in the garden. 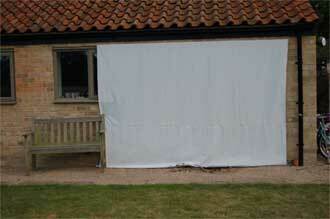 Setting up an outdoor cinema in the garden is relatively straightforward, and probably not as expensive as you imagine. It’s also a great way to make more of your garden in the evening. First, you will need a projector and it’s worth getting something pretty good. Luckily, you can often buy these second hand on eBay or similar sites for £200-300. You will want a digital HD projector. I use an Optoma HD65 – it’s simple to set up, good quality and gets enthusiastic reviews. The other main item you need is a screen which you can construct yourself in a couple of hours from blackout blind material. You can buy this from a fabric or curtain shop for a few pounds a metre (width is around 1.4m) and it’s the smoother, almost rubbery side you will need to project onto. Sew together two 3m long sections on a sewing machine and then hem the sides for a bit of extra neatness. The join will be horizontal as you look at the screen. The material doesn’t fray so you don’t even need to finish the edges. The next step is to attach the screen to a length of planed smooth timber 3m x 34mm x34mm. 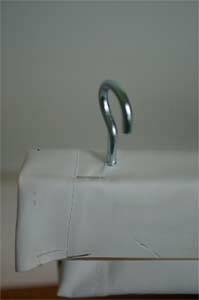 Attach the top edge of the screen to the back and top of the wooden baton using either tacks or a staple gun. You can do the same to the bottom edge of the screen with another length of timber. To enable you to put up or remove the screen with as little fuss as possible, attached three 75mm long stainless steel hooks equally spaced along the top of the screen. Do this by drilling through the material into the wood to make pilot holes and then screwing them in by hand. These hooks need to be mirrored by three 75mm long vine eyes which you need to attach to the wall where the screen will hang. Drill a hole, add a raw plug and then screw in the vine eyes. 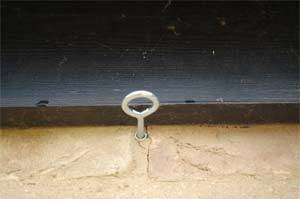 Once the top edge of the screen is hooked onto the wall, simply roll the excess material around the bottom length of timber until the screen is taut. Then, when you want to pack it away, just unhook it and roll the whole screen up. You can play the movies off of pretty much any laptop using the native media software (e.g. Windows Media Player etc….) – you just need to connect your laptop to your projector. This can be done in various ways depending on the video output on your laptop and the video input on the projector. In most cases it will either be a VGA or HDMI output on the laptop and VGC or HDMI input on the projector. You will just need to purchase (if you haven’t got one already) the correct lead to joint them together. Typically you should be able to purchase one for around £5. You will also need some speakers. We use JBL computer speakers which cost less than £30 and work perfectly well. Also, remember to house the projector and laptop somewhere dry as you will be watching movies at prime ‘dew-falling’ time – for example an open fronted wooden box. Finally, do remember to respect those living nearby – never let your cinema cause noise or light pollution and make sure neighbours can’t see your screen whilst it plays.